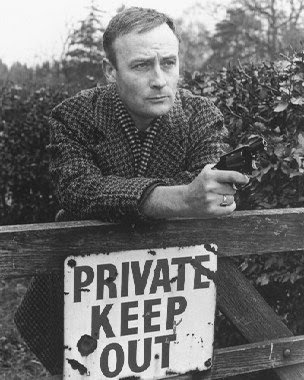 It's tragic, really, that Edward Woodward passed away before he saw the DVD debut of the early episodes of the series that made his name, Callan. 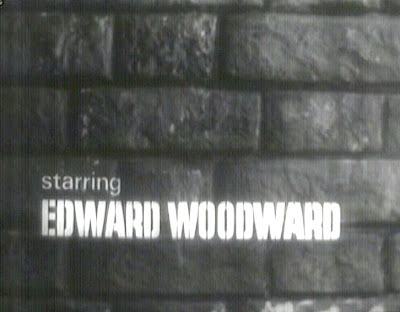 Kudos to Network for getting over the clearance hurdles with Fremantle and Studio Canal who now own the Thames and ABC archive and finally letting the public see Woodward in dazzling form as David Callan in episodes from the two series made in 1967 and 1969. I am aware that they had plans to interview Woodward for this release but then fate stepped in and we were cruelly deprived of his recollections. Alas, only the pilot and two episodes of the first series survive, on video at least, But it's enough to get a true sense of creator/writer James Mitchell's ambition to provide a complete antithesis to the spy-fi glamour and self-parody of the James Bond film series, which by the time pilot episode A Magnum For Schneider was transmitted in February 1967, was completing production on You Only Live Twice. Mitchell's series was firmly following in the footsteps of the harder le Carre and Deighton spy fiction of the 1960s and with producer Terence Feely, he steered the series into exploring the gritty, twilight world of a spy dealing with the consequences of World War 2 and the ensuing Cold War, the ambiguity of an era where the methods employed by government security services in both the West and the East overlap to such a degree that both sides seem as amoral as each other. Let's not forget that the Berlin Wall had gone up in 1961, dividing Germany, and before the second series went out in 1969 the Soviets had invaded Czechoslovakia to quash its planned reforms. 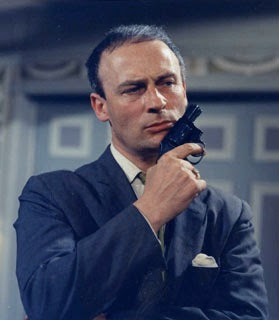 Callan was therefore one of television's first anti-hero characters and the series was an abrupt volte face to the pop glamour of The Avengers, which had long abandoned its grittier crime elements by 1967, and to the fantasy heroics of ITC series such as The Champions, Department S et al. You could feel the dirt under your fingers with Callan. David Buxton clearly defined the series' position in the television landscape, in From The Avengers To Miami Vice: Form And Ideology In Television Series, "As the decade wore on the spy genre fissured into two distinct forms; on the one hand the 'ultra-realist' genre made popular by le Carre in which unglamourous, shadowy characters went about their business in a morally ambiguous world; on the other playboys who carried out vague missions in tourist playgrounds against secret international organisations." We're introduced to James Mitchell's creation in an edition of ABC's Armchair Theatre, a play entitled A Magnum for Schneider, where the format of the forthcoming series is already clearly delineated. The iconic, downbeat theme music, the swinging light bulb shattered by a gun shot are all present and correct. 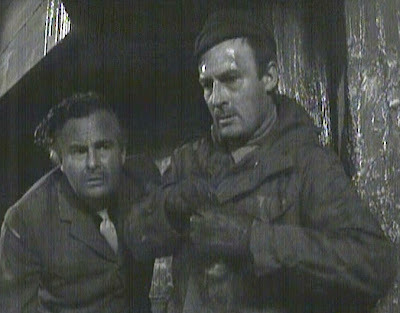 The play tells us that Callan was an agent for 'The Section', an anonymous branch of the British security services which is run by 'Hunter', the cover name for the chief, and portrayed by a series of different actors, in very similar fashion to the way The Prisoner would change the actor playing Number 2. Hunter and his agents are experts in removing those who threaten the status quo, using any means necessary to restore the balance of Cold War power. Callan is volatile, ill-natured and cynical because he despises his work and his own nature but often his vulnerability will show through and his achilles heel will be the empathy has for his victims. He's an example of what John Tulloch calls 'an alienated and psychologised existential hero'. He's called in to do one last job for the Section. He must eliminate gun-runner Schneider who has so far eluded the authorities. As Callan plays on his and Schneider's shared passion for lead soldiers and war games, Hunter despatches his underling, Toby Meres, to make sure Callan kills Schneider - setting him up for the murder and to ensure the police catch him in the act. But when Callan turns the tables on Hunter and leaves an unconscious Meres lying next to the dead Schneider, Hunter decides Callan's details should be transferred to a red file - the sign of a man marked for death. Magnum For Schneider also introduces Lonely, Callan's rather unhygienic snout, played with great relish by the superb Russell Hunter. 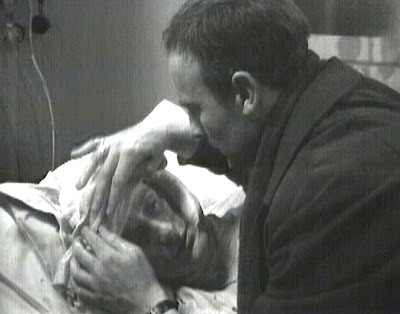 The love-hate relationship between the two men is based on Callan's contempt for Lonely, whom he often threatens with violence if he's reluctant to carry out tasks. And yet Lonely has a deep respect for Callan. 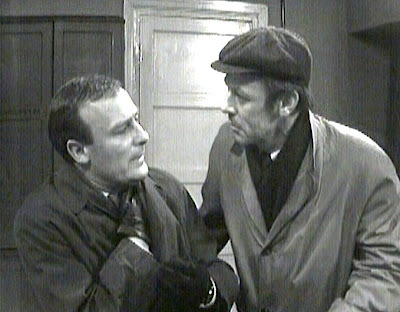 These two working class (in the case of Lonely, not even that) men, damaged by their own vulnerabilities and paranoia, are strikingly contrasted with the rather more public school, upper class operatives in the Section, Toby Meres (played by Peter Bowles in the Armchair Theatre 'pilot' and then by Anthony Valentine in the series) and Hunter. Again, Callan's methods are respected by Meres and both will support each other in missions but on a personal level there is certainly no love lost between them. 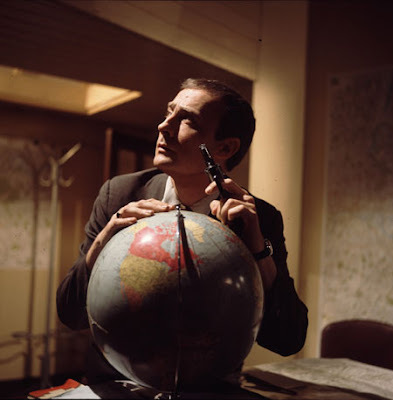 The two surviving episodes of the first series do sum up the powerful nature of the format and the complex morality of Callan's nature and how it interweaves through his personal and professional lives that James Mitchell sets out to unpick. The Good Ones Are All Dead sees the series pick up directly from the pilot where, under threat of being placed in Hunter's red file, Callan is coerced into helping the Section hand over an ex-SS officer, Strauss, to the Israelis. Similarly to the pilot, and certainly it's a recurring motif in the series as a whole, Callan goes undercover as a book-keeper to Strauss. He wins Strauss' confidence but not that of his secretary Jeanne (an early role for Linda Marlowe). However, it's clear that Jeanne is more than just his secretary. The story offers up a web of moral questions about war crimes, the power of love and remorse to change the nature of evil. The climax is stunning and plays out in a powerful two hander between Edward Woodward and Powys Thomas as Strauss. The final episode of Series One is You Should Have Got Here Sooner which sees Callan getting his own back at Hunter and Meres by exposing Meres as a member of British security to an escaped KGB agent, Pollock. It's also revenge for Meres violent treatment of Lonely after the man has inadvertently broken into the safe house where Pollock is being held and Meres has beaten him very badly. It's very much an episode about loyalties - that between Callan and Lonely, that between Callan and the Section as well as a romantic sub-plot between Pollock and his girlfriend Sue Lyall. Series Two sees a replacement Hunter in charge of the Section and one who would rather have Callan working inside rather than freelance. Red Knight White Knight is a cat and mouse game of KGB defectors and potential assassinations that twists and turns very effectively. The closing third act is a tense denouement that sees Callan vindicate his usefulness to the new Hunter. The episode is complemented with good cameos from established British television actors John Savident and Duncan Lamont as well as outstanding performances from Woodward, Valentine and Michael Goodliffe as the new Hunter. The Most Promising Girl Of Her Year demonstrates to us why Callan shouldn't get to close to the cases he's engaged with. Joan Mather is a young biochemist who works at a Biological Research Centre where experiments are being done to create new types of bacteria for germ warfare. When Joan announces her intention of leaving, her boss becomes alarmed as Joan has a photographic memory and could be a threat to security. It emerges that Joan has an East German boyfriend, Horst, who is in actual fact using her to get to the information in her memory. The episode again delves into Callan's self-loathing, especially when his work becomes a corrupting force within the innocent Joan's life. It also introduces us to the Section's preferred methods of brainwashing at the hands of recurring character Snell, played with ruthless efficiency by Clifford Rose. The Section are after Andre Brezhevski who is working for the Russians as a scientist in The Little Bits And Pieces Of Love. He is developing a fuel for a rocket powered nuclear warhead and British Intelligence want it. Callan must use Andre's ex-wife to persuade him to come to England. 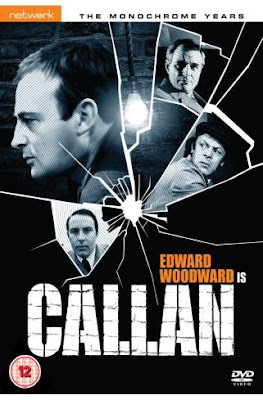 Again, the series shows how manipulative and compassionless Callan must be in order to carry out his task but Edward Woodward always ensures that the character displays his weaknesses, the regret and remorse that torments him. A fine episode, featuring the brooding Vladek Sheybal as informant Dicer but slightly marred by a rather overwrought, theatrical performance from Pauline Jameson as Brezhevski's wife, Sophia. Let's Kill Everybody devastatingly turns the series inside out when Callan, off on sick leave, must prevent an assassin from killing Hunter, Meres and the other operatives in the Section. It's a bold episode that isn't afraid to dispense with the series established pattern. The consequences of this continues with the plot of Heir Apparent which then takes Callan and Meres on a joint mission to East Germany to bring back a British agent who has been selected as the next Hunter in charge of the Section. One of the few episodes to move out of the claustrophobic studio environments at ABC and play out much of the drama on location, this is a satisfying slow burn and a bit of a nail-biter as Callan and Meres attempt to get the new Hunter over the border. The chemistry between Woodward and Valentine is really at its best here and there's also a great cynical rapport between Callan and the new Hunter, played by Derek Bond. The Death Of A Friend demonstrates just how atypical this series could be. An internal battle within the French OAS results in the death of French agent Jean Cocquet. Callan discovers that Jean's estranged wife Francine Coquet is embroiled in the murder. His homosexuality and the relationship with a young French man Marcel Latout adds a further dimension to the man's death and it's only until Latout and Meres are caught in a bomb explosion that the truth comes out. Woodward again beautifully shows how, deep down, Callan does care and is sensitive to the emotional, as well as political, complexities of his line of work during a very poignant scene with Latout, his compassion standing in stark contrast to the homophobia from Francine and Meres. The always brilliant Allan Cuthbertson features in The Worst Soldier I Ever Saw, here edited back into episodic format from the raw studio footage that existed, as a former British Army Brigadier, Pringle, planning to work for an Arab sultan who is spying on the Americans and British. Callan, previously having been kicked out of the Army by Pringle, is employed as his batman and goes undercover to expose the man. 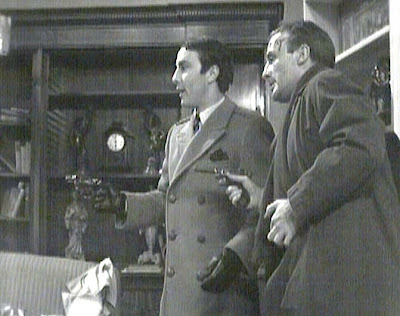 The final two episodes on the set, Nice People Die At Home and Death Of A Hunter complete the remaining black and white episodes of Series Two and the latter is again a thrilling story that sees Callan brainwashed and turned against the Section. Woodward and Valentine are joined by Ronald Radd, back again as Hunter (he played the same character in the pilot and Series One). I shall leave those of you who have never seen the series to find out how this ends. The series did continue, in colour, into the 1970s and I'll be back to review the Network DVD release later in the year. An iconic British drama, extremely well written by James Mitchell, Robert Banks Stewart and Ray Jenkins amongst others who pioneered a 'literary' form of television scripting in Callan, that developed from its roots in Armchair Theatre. The early episodes embrace the noirish attributes of recording in black and white and are all the better for it, steered by some of the best directors working in television at the time - Peter Duguid, Bill Bain, Piers Haggard, Robert Tronson to name a few - and are compelling and intriguing. Callan certainly paved the way for the psychological realism of Public Eye (another extremely underrated ITV drama), the early Special Branch and must have influenced the likes of The Sandbaggers and The XYY Man. Woodward went on to become one of the best television and film actors of his generation and will not only be remembered for Callan, but also for The Wicker Man, 1990, Breaker Morant and The Equaliser in a long and very accomplished screen career. What's a bit of a shame is that the set has no extra features - not even an image gallery - and, whilst I can understand the expense and time that's gone into getting these episodes cleared, such an iconic series at least deserves some context. Several of the writers and directors are still alive and it would perhaps have been interesting to hear their views about the series on a commentary or two. But thanks to Network these episodes can now see the light of day beyond the dodgy bootleg copies that have been doing the rounds for years. And if you've never had the pleasure of Callan, I recommend you dive in and see the resulting combination of great writers, great directors and a very special lead actor. A brilliant series. I spent last weekend watching all episodes,and it is a contender for the Greatest TV Seies Ever. Even after forty years,the acting and the scripts are superb. Edward Woodward and Russell Hunter were marvellous actors who made their characters live and breathe in a twilight world of danger and deceit. One of the bleakest mainstream programmes ever made, along with the neglected "Public Eye" series, this is a must have. Quite so. I'll be reviewing the colour episodes in the Summer. 'Public Eye' is also one of my own favourite series. A neglected gem. Very few Canadians have had the chance to see the colour Callan series let alone the Monochrome set; they really are televsion theatre of the highest calibre, then and now. The Richmond trilogy is perhaps the best of the lot. T.P. McKenna reigns as the brilliant mind-phooker nemesis of Callan.